Gibbs Smith Publishers, 9781423602255, 416pp. 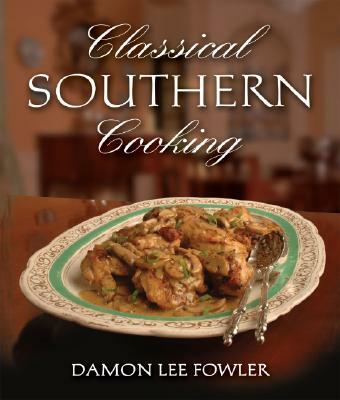 Damon Lee Fowler's critically acclaimed and award-nominated celebration of classic Southern cooking returns to print in a fully revised and updated edition. Hailed as a bible of Southern foodways and a major contribution to the literature of American culture, this compendium of more than two hundred traditional recipes broke new ground in food writing. Rooted in meticulous scholarship, a passion for good cooking, and a deep love for the unique culture of the South, Classical Southern Cooking presents the history and substance of this cuisine in a uniquely casual and anecdotal way that has earned it a reputation as a modern classic. Here are all the icons of the Southern table, from humble to sublime-boiled peanuts, golden fried chicken, smoky barbecue, fluffy biscuits, crusty skillet cornbread, mint juleps, and rich pound cake. Here, too, are many surprises from history's table that would be considered cutting edge at any modern restaurant-Gulf shrimp-stuffed tomatoes, delicate stuffed spinach soup, venison medallions with cranberries and Madeira, robust trout steaks with rosemary and white wine, quail stuffed with oysters, and young, tender chicken sauteed with bourbon and wild mushrooms. Supplemented by new research, enriched with new recipes and elegant new photography, this timeless classic is essential for the kitchen of anyone with a passion for food history and simple, good cooking. Damon Lee Fowler is a nationally respected authority on the history of Southern foodways. He has authored six critically acclaimed cookbooks including The Savannah Cookbook and New Southern Baking, has edited and annotated three facsimile reprints of important American cookbooks, and was editor and recipe developer for the Jefferson Foundation's first Monticello Cookbook, Dining at Monticello. His work has appeared in Food & Wine, Relish, and Charleston Magazine. He lives in Savannah, Georgia, where he teaches cooking and is the feature food writer for the Savannah Morning News.